PCE-RCM 10 is a portable handheld air sampler or particle counter used to monitor particulate matter (PM) concentrations in the air. Designed to aid in indoor air quality (IAQ) assessments, this particle counter also measures air temperature and relative humidity (RH). The air sampler PCE-RCM 12 is used for indicative testing of environmental parameters. The air sampler PCE-RCM 12 enables the measurement of CO2, fine dust, temperature and relative humidity. The bright display of the air sampler provides information about these parameters. This Data Logger meter is very economical. With this Data Logger meter you can measure wind speed and air temperature. This Data Logger meter is very economical. With this Data Logger meter you can measure wind speed and air temperature. These test instruments are calibrated by the manufacturer. An ISO calibration certificate is available as an option. Data logger to measure air temperature and velocity with calculation of volume of air current and RS-232. This kind of airflow meter is mainly for use in HVAC systems. The logging instruments are manufacturer calibrated and are delivered incl. ISO calibration certificate. PCE-WSAC 50 is an air velocity meter alarm controller that displays the current wind speed as well as the average wind speed of the last 2 and 5 minutes. This air velocity meter alarm controller allows measurement of the slightest of wind movements. PCE-WSAC 50 is used for a variety of wind monitoring applications in industries such as construction, mining, renewable energy and manufacturing. This Air velocity meter is very economical. With this air flow meter you can measure wind speed and air temperature. Once you have the right cross section, the Air velocity meter will show the air flow. All the test instruments come manufacturer calibrated. ISO certification can be made as an option. This air velocity meter has a good relation between price and quality and it combines accuracy and versatility with the ability to transfer data directly to a computer. This air velocity meter forms a part of a professional's basic equipment to regulate and test ventilation systems. All the test instruments come manufacturer calibrated. ISO certification can be made as an option. The PCE-423 Air Velocity Meter with thermal sensor is highlighted by its good relation between price and quality. The PCE-423 Air Velocity Meter has a high resolution to be used for different applications. 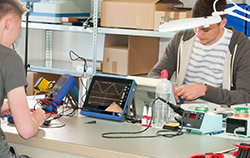 All the test instruments come manufacturer calibrated. ISO certification can be made as an option. The PCE-423 is a high resolution air velocity meter to measure air velocity and temperature in varied situations. The air velocity meter belongs in the basic toolkit of professionals working with ventilation systems, as well as being useful in institutional research and development. Without a doubt, the main advantage of this handheld cup vane Air Velocity Meter is that it doesn't need to be held exactly in the direction of the wind. Air Velocity Meter with impellers typically have to be held exactly in the direction of the air flow to take accurate measurements. Digital cup vane Air Velocity Meter, wind direction will not influence the measurement. The air velocity meter PCE-EM 890 is an instrument for measuring environmental conditions. Thus, this air velocity meter is ideal for technicians, sailors, farmers and many more people who are dependent on the weather or whose activities are significantly influenced by the weather. The Air Velocity Meter combines various functions and sensors in only one instrument: Air Humidity Meter, Wind direction, Wind speed, Temperature meter, rainfall, and data logger. Furthermore, the meteorological station has different alarm functions and settings for the measurement parameters. The measured data can be sent by radio to the base unit (max. distance of 100 m). This test instrument is equipped with the latest technology used in meteorological analysis. The touch screen allows you to recall data onto the screen easily. The PCE-FWS 20 Air Velocity Meter is for private and professional use. This meteorological station allows the accurate detection of wind direction, wind speed, temperature, relative humidity and precipitation. The USB port and the included cable allows transmission of data from the device to a computer. Software for analysing data is also included, which enables you to analyse and check meteorological fluctuations, presenting data in graphs and diagrams for measurements over prolonged periods of time. The Air Velocity Meter PCE-PDA 10L is a reliable differential pressure gauge for pressure measurement of gases in the range of ±20 kPa. The Air Velocity Meter PCE-PDA 10L has many different pressure measuring functions. Air velocity meter with external flexible probe to air velocity, air flow and temperature. The PCE-TA 30 air velocity meter shows measurement values in its large backlight LCD display. The air velocity meter shows the current value on the display as well as max. and min. values. The Air Velocity Meter PCE-VA 11 is an extensively used measuring instrument. This air velocity meter offers the opportunity to determine air speeds, air temperature and infrared temperature. The illuminated LCD allows comfortable readings and facilitates use in dimly lit areas. The Air Velocity Meter PCE-VA 11 is a useful and versatile device for measuring air speeds, air temperature and infrared temperature. Thanks to the fast response time of the device, real-time measurement is possible without problems. The large display provides an accurate overview of the measured values.